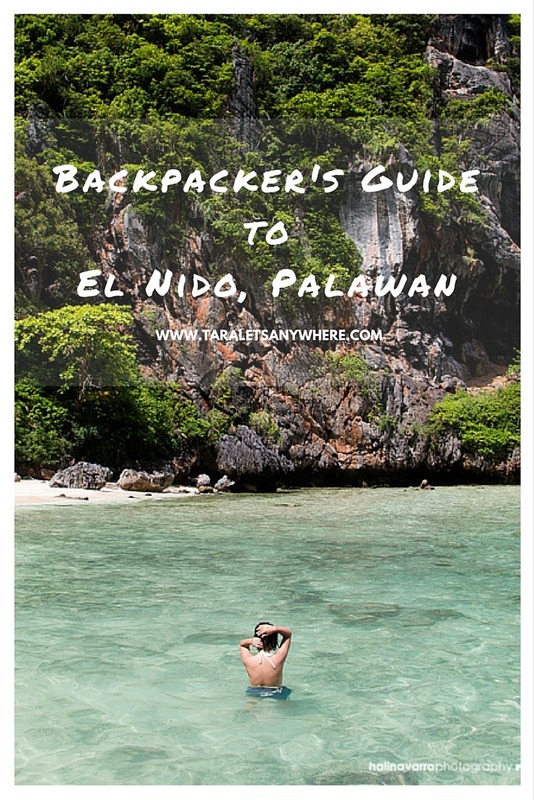 So here’s a budget-friendly El Nido travel guide, i.e., how to travel to El Nido, Palawan, with about P7000 for 5 days. Contrary to popular belief, vacationing to El Nido can be as cheap as in any other provinces in the Philippines. I’m not really sure why there’s a public perception that you need P10,000-P12,000 per person or even more to go here. Perhaps this was before rate standardization. Here’s what I know: today this place can also be a backpacker’s paradise. One of the first tips I can give you if you want to get discounted rates on tours and rooms is to go during off-peak season. The caveat is that the off-peak season coincides with the rainy season and there’s a chance that tours may be cancelled. However, Palawan doesn’t experience heavy typhoon as do other provinces in the Philippines, so you’d be really unlucky if this is the case. 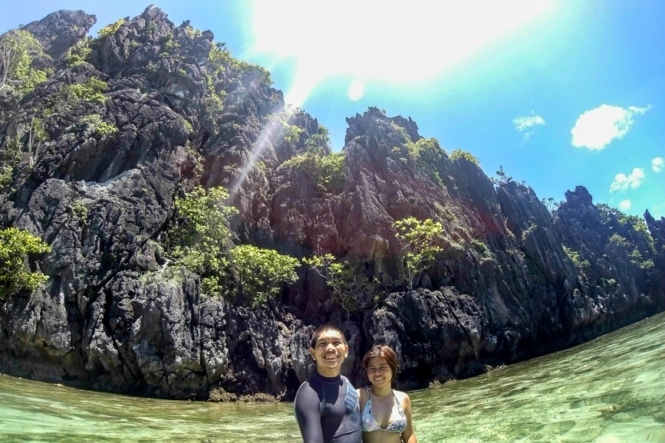 Before moving forward, you may first want to read our experience in El Nido, Palawan here. Here’s a sample 5 days itinerary to El Nido. If you only have 3 days in El Nido, we suggest spending two days for island hopping in routes A and C and the third day lounging in Nacpan Beach. To get to El Nido, you need to take a flight to Puerto Princesa. Once you’re at the airport, you can take a van directly to El Nido or ride a tricycle to San Jose Terminal and get on a bus (cheaper option). The last bus trip is at 9PM, with the Cherry line. You can find Cherry Bus schedules here. Once you get off at the terminal in El Nido, ride a tricycle to your selected accommodation. El Nido is 5 hours away from Puerto Princesa City, so when creating your own itinerary allot 2 days for travel. So basically there are four island hopping tours in El Nido. The most recommended ones are tours A and C. If you’re short on time, avail of these two. Tour A is also called lagoon tour because it includes the famous Small Lagoon and Big Lagoon. 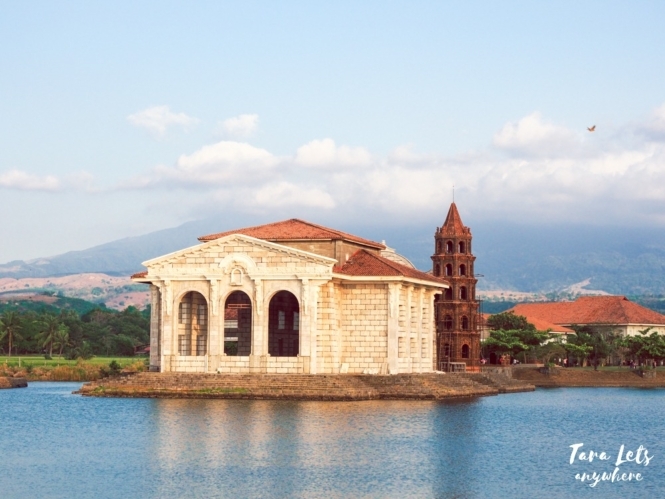 Meanwhile, tour C includes great snorkeling spots, including Star Island and Matinloc Shrine. I’m going to skip the other tours because I believe they have already been comprehensively discussed in other travel blogs. There are travel agencies that offer complete packages including round-trip transfers from Puerto Princesa to El Nido, accommodation and tours. Almost all lodgings also partner up with tours, so for convenience you can simply inquire at the the reception of your selected lodging. During off-peak season (June to November), it’s cheaper to avail of the tours individually instead of getting a complete package. Travel agencies offer each tour for as low as P800-900. Island hopping tours normally begin at 9AM, so be on your way looking around travel agency offices for cheap packages at about 7AM. Don’t worry, there are dozens and you can easily spot them especially near the beach that serves as jump-off point for island hopping tours. TIP: Confirm that the environmental fee, as well as vest and snorkel rental, is already included in the quoted rates. If you’re visiting during high-peak season, reserve in advance. For the inland tourist attractions, you can rent a tricycle (good for 4 people) or, if you know how to drive, rent a motorcycle (good for 2 people). The regular price for tricycle tours is P1500 though it can be haggled down to P1000, and motorcycle rental fee for a whole day is P400. Renting your own motorcycle for a day is the cheaper choice, but I suggest to rent a motorcycle only if you’re experienced in handling one. Our trike driver told us that most foreign tourists opt to rent a motorcycle and are infamous for getting into accidents, citing two reasons: (1) a lot of those involved in accidents are not good drivers in the first place, (2) it’s hard to navigate the motorcycle to Nacpan Beach because the last hundred meters or so is a dirt road. El Nido is teeming with all sorts of accommodation, from 5-star hotels to budget-friendly inns and dormitories. Planning to visit El Nido soon? Check out the lowest prices of El Nido hotels and inns here. I actually wrote an initial draft detailing our dining experiences here, including order an overpriced hot chocolate that seems like Milo with lumps of powdered milk and lack of service water (or offered alternative such as mineral bottles) in at least two of these. In the end I decided not to since it would’ve sounded only like a long rant. I’m not sure if there’s really a lack of good restaurants in El Nido or we just happened to dined on poor choices. Anyway, I think it’s better to dine instead in ordinary carinderias. It’s cheaper and will probably serve better-tasting food. Again, this is our experience. If you have any recommendations, please post them in the comment section. 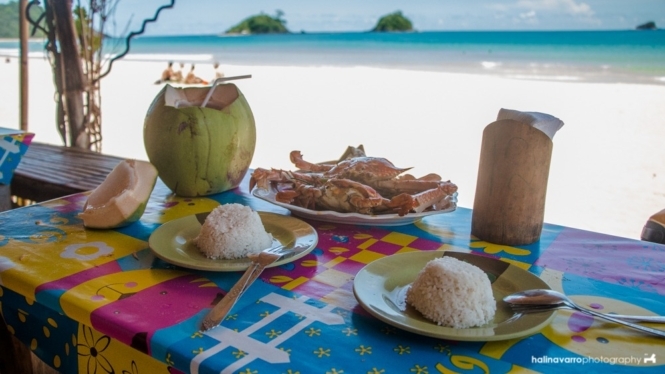 Aside from the restaurants in the list, we also liked Prince Restaurant in Nacpan Beach. Their garlic-sauced crab dish is a must-try and costs only P200 for 2 people. Hali and I like Republica Sunset Bar because the food is decent and reasonably priced. In addition, as previous travelers have said, Republica Sunset Bar offers the best view for sunset watching in El Nido. We were happy to be chugging down cold beer and snacking on chicken croquette and burger while watching the sunset. Make sure to be there at 5PM or even earlier to get good seats. And here is how I’m ending this El Nido budget guide, with us viewing the sunset in El Nido. Sunset viewing at Republica Sunset Bar. So here’s what you’ve been waiting for! I’m gonna show you the budget breakdown for a 5-day trip for 2 people. These are the essential expenses when backpacking to El Nido. I’m aware that there’s a lot of miscellaneous expenses I haven’t included, which is why I put a safe budget recommendation at the bottom. Please note that we were able to get discounted rates because we went during off-peak season. During summer, or any time between December and May, you’ll be hard-pressed to get discounts. In some cases there are even higher markup rates, except for the island hopping tours, which are regulated and thus follow a set of published standard rates. Discounted rates mentioned below are good for locals only, as far as I know. For instance, tricycle drivers are most likely to amp up the price up to 5x for foreign tourists. I’ve read an account where a trike driver asked for P250 for a trip that would’ve cost P50 if not a little big higher. As said in the above, these are costs during off-peak season. Prepare to spend about P10,000 or more for 5 days if you’re going during high-peak season (summer and holidays). P.S. Heading to Palawan soon? Here’s a related travel guide to Coron, which can be reached via an El Nido-Coron ferry. Here’s also a travel guide to Balabac, including an island hopping guide to Balabac. Any other tips to add to this budget-friendly El Nido travel guide for backpackers? Post them below! If you liked this post, save it in Pinterest! Yeah in high season plan on this budget being doubled. (Also, pre-planning is a must, as all the reasonably priced accommodation is booked out weeks/months in advance). Food is about 300pesos a person/meal. Then you calculate in all the extra costs of things (drinking, transport, other activities) and it is very easy to spend 20.000pesos in a week. Yes, I think in most places naman talaga cheaper ang accommodation pag off peak season. An invaluable guide for a budget traveller! Thanks a lot for the insight. Message understood: the off-season between June and November is the best time. But what month would you recommend as the most convenient to plan a visit? Does it matter? It’s not necessarily the best time as it’s within the rainy season, but the rates are cheaper during that period. Depends on what you mean by convenient? I guess the price will go up a lot if you add the airfare. Hi! just a question, where did you booked that tour A and C that only cost you 900.00 pesos each? Btw I’ll be going to el nido next week and I’ll be going there solo. Thanks.